Wide, cone-shaped spray surrounds a powerful column created by an all-brass, precision-machined nozzle. 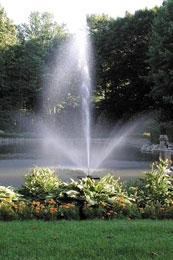 The center spray can be adjusted for height making this an ideal fountain for commercial and residential applications. Wide-spreading display creates a broad feature to fill any lake scene. An impressive cascade of water that sounds as beautiful as it appears. Sprays at heights of up to 20' on the 1/2-HP model (40' on the 1.5HP model).